Daniel Johnson was born in the small town of Danville in 1915. He was the child of a mixed marriage, his mother was a French Canadian and his father, Francis Johnson, was an Irish Catholic. He was raised bilingually although he was entirely educated in French. The Johnsons had eight children, four of them were boys who all pursued, each in their fields, very successful careers: Daniel became the Premier of Quebec, Reginald an eminent cardiologist, Maurice was appointed judge, and Jacques became a professor of sociology. The family success was that much more remarkable when it is recalled that the father was a modest labourer who toiled hard, with his wife, to educate his children at a time when education was not widespread and rather expensive. Daniel Johnson studied at the Séminaire de Ste-Hyacinthe, where he obtained his BA, and at the Faculty of Law of the Université de Montreal. He was called to the Bar in 1940. While at university he was engaged in various student activities. He became president of the student union of the university, was a noted contributor to the student newspaper, Le Quartier Latin, was associated with various patriotic youth associations as well as Catholic organisations. He became president of the Canadian Catholic Federation of Students and, in this capacity, he was a delegate to the world Pax Romana congress held in New York in 1940. In 1946, he was elected to the National Assembly, under the banners of the Union Nationale, to represent the riding of Bagot. He was re-elected continuously in this district until his death in 1968. As a backbencher of the Duplessis government, he did not play an important role and did not attract much attention except for his loyalty to the party and to Duplessis himself. In 1954 he became the Parliamentary Assistant to Duplessis. This was to tarnish his image in the future as close association with Duplessis will hardly give anyone bragging rights at the time of the Quiet Revolution. While he occupied the post of Assistant to Duplessis, and for quite sometime thereafter, he was to be mercilessly portrayed by newspaper caricaturists, especially by Normand Hudon of Le Devoir, as a small joker, a court jester, always at the foot of Duplessis, ready to please and at his beck and call. In the press, he was dubbed with the demeaning nickname of Danny Boy. It will take him a long time to overcome this negative perception. 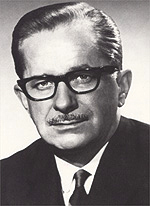 In 1958, he was appointed Minister of Hydraulic Resources. As such, and over the next four years, he was confronted about, and had to answer for the growing scandals of the late Duplessis era. In 1961, at the Union Nationales first leadership convention, he was elected to head the party. In two years, the party had had four leaders: Maurice Duplessis, Paul Sauvé, Antonio Barrette (who lost the election of 1960 to the Liberals of Jean Lesage) and now Daniel Johnson. Any party that has gone through such changes in a short period of time would inevitably be somewhat in disarray. Lesage used that opportunity to call an early election in 1962; furthermore, he called it with a programme of nationalisation of the hydroelectric companies of this province, a measure that had always been popular ever since the Great Depression. The slogan of the Liberals was: Maîtres chez-nous [Masters in our own house]. During the election, Johnson was cast into the position of defending the past, a position hardly very popular given the disfavour into which duplessisme had fallen and the obvious desire of the electors for change. In 1962, the Liberals represented change. In the first ever televised leaders' debate, shortly before voting day, Johnson lost very badly to the charismatic, flamboyant and confident Lesage. By contrast, Johnson had been hesitant, nervous, unconvincing and failed to convey warmth. The results of the election confirmed that the electors preferred the Liberals who increased substantially their majority of votes and seats. Many might have given up given the crushing defeat. Instead, Johnson set about to change his party. A significant process of democratisation was initiated. Numerous regional and national meetings were held to establish a strong grass-root base and define a programme more in tune with the times. Johnson worked incessantly in the trenches trying to regain the old support of the party. In the meantime, the government of Lesage went forward, convinced as they were that they were the bearers of truth, and moving heaven and earth in the process of modernising the province. They did not always stop to explain their policies to the population. They multiplied taxes, increased the debt of the province, raised expectations so high that they could not possibly be fulfilled. They were by-passed on the left and on the nationalist fronts. Third parties appeared that would siphon off votes from them. They did not sufficiently alter the electoral map to make it reflect better the population distribution, away from the rural areas to the fast growing urban ones; consequently, the rural areas remained over-represented. Large categories of electors were left behind by the government. The elections of 1966 stunned the Liberals. Even though they obtained 47.3% of the votes to the Union Nationales 40.8%, the Liberals lost the elections (56 seats to the UN, 50 to the Liberals). This was not the first time that the electoral system had produced results such as these, and it was not to be the last. A sense of great despair gripped the more progressive part of the province: the Quiet Revolution had come to an end! The next two years were to alter significantly the perception that many in the province had of Daniel Johnson. Once in office, he rose to the challenge, worked incessantly, grew in stature. In a quiet but determined and efficient way, he pursued the reforms of the Quiet Revolution. There was no returning to the past. There was no challenge to the real gains achieved by the Quiet Revolution. The government followed a cautious but clear course of action. The time was ripe for optimism in any case. The economy was booming thanks to favourable world conditions, but as well as a reflection of the many public works projects associated with Canadas centennial and with Expo 67. In 1967, when the worlds fair was held in Quebec, Montreal was the capital of the world. Millions visited the province; numerous heads of state came calling. Johnson basked in it all and did not seem out of place. He became quite popular and evidently liked. His amiable and non confrontational personality certainly contributed to that. So did the fact that he had the pulse of the people and that, at a time of revaluation of the place of Quebec and of the role of French Canadians, he seemed to embody the ambivalence that Quebecers have toward Canada. In 1965, as part of a larger movement of reflection on the future of the province, Daniel Johnson had written a small book entitled Égalité ou Indépendance [Equality or Independence]. In it he argued that the time was ripe to change profoundly the Canadian federal system. It had to be remodelled on a bi-national basis, failing which independence would be the only course of action left. Canada was one country with two nations and one of these nations was neither happy, nor treated equally. This had to change and it should be the job of the constitutional process to put it to right. What would be the destiny of the province, he did not know. What he did know was that the choice was between equality within Canada or independence. Separatism, a word he did not use, did not frighten him. The first paragraph of his book was typical: Lhistoire de la nation canadienne-française est avant tout lhistoire de ses luttes constitutionnelles, lhistoire dun peuple à la recherche dune patrie. [ The history of the French Canadian nation is first and foremost the history of its constitutional struggles, the history of a people in search of a country]. In the face of the growing dichotomy between federalists and separatists around 1967, his stand seemed noticeably ambiguous. However, there was no doubt that it reflected the ambivalence of the people of Quebec about their future. Once in power, he set about to achieve his objective. The constitutional process was reopened thanks to John Robarts, the Premier of Ontario, who convened the Confederation of Tomorrow Conference in Toronto in 1967. Hope, indeed optimism, was re-established. In the end, the process was to fail. In 1968, Daniel Johnson died in office. His death provoked genuine grief and sorrow among the people of Quebec.